OIDE is a mobile platform that we are developing to deliver course materials. The 2k17 version is available for download in the GooglePlay store. A desktop version can also be downloaded. Our Apple Version will be available soon. 2017 students are already registered to OIDE and their usernames are the first two letters (capitals) of first name + first two letters of surname (capitals) + date of birth YYMMDD. A universal password “oide17” is set for all accounts but should be changed on logging in. The password is changed via menu options at top left corner. Parents/ Guardians can look at student scores and listen to their audio work as well as tutor feedback. 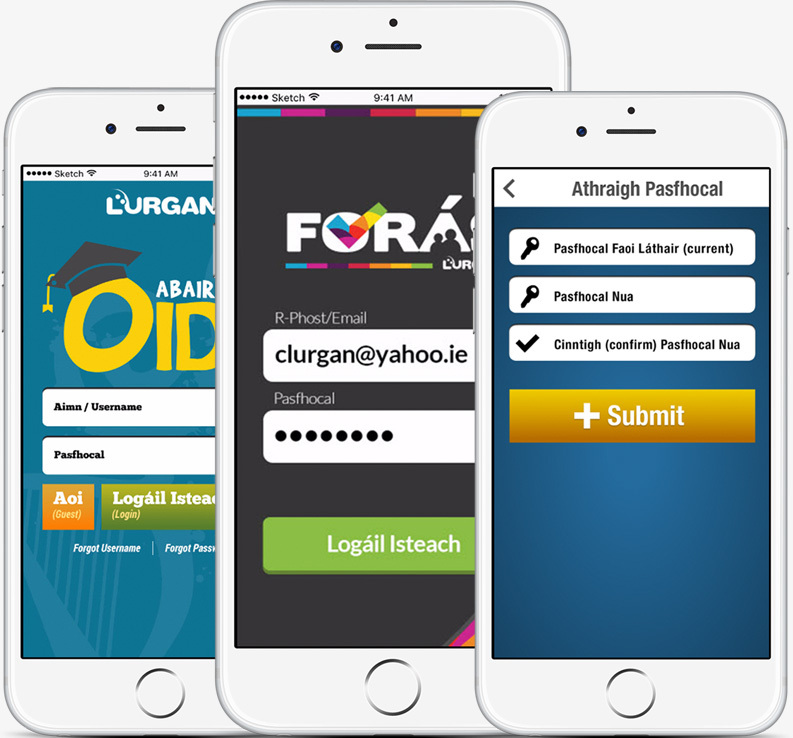 The Parental/Guardian login is similar to their child’s with a “t” (for tuismitheoir) added. 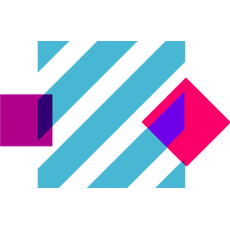 The temporary password is – oide17. Changing Password: Passwords are easily changed (see menu options) but as email addresses are not used, there isn’t a forgot password option, so keep your password simple and easy to recall. 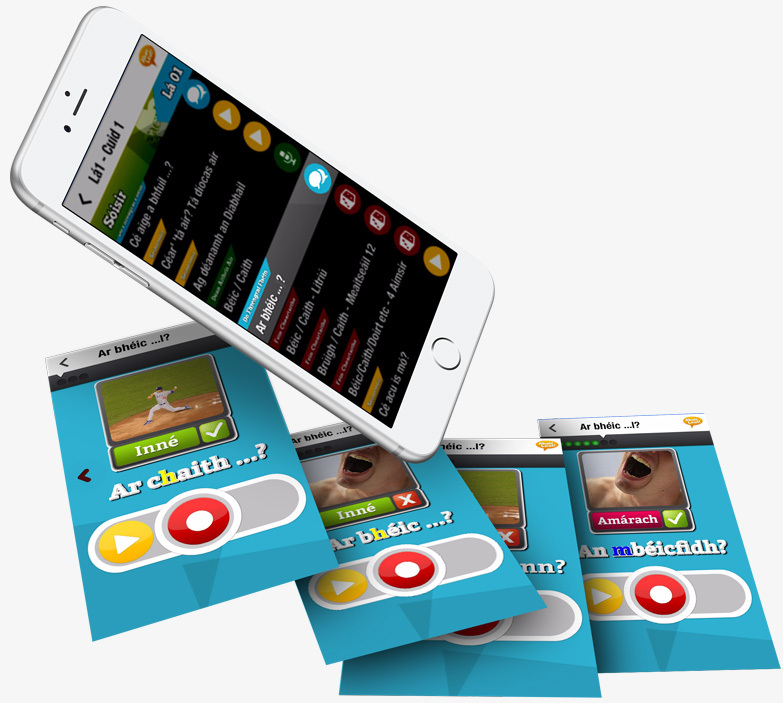 OIDE focuses on functional, everyday Gaeilge as used by native speakers in Conamara. 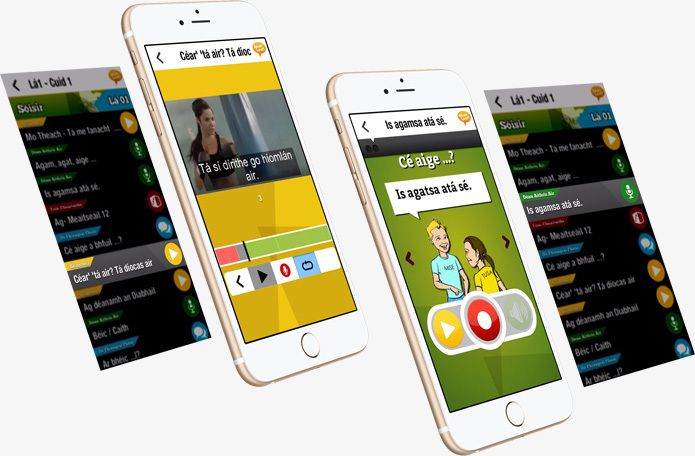 Native speaker audio material is used to demonstrate and enhance pronunciation. The play/record/playback process allows learners to listen as many times as they need to internalise the sounds, and then practice as often as necessary to hone pronunciation skills. The content is kept relevant with emphasis on the fundamentals of informal, social interaction. The simple Q and A format underscores the conversational approach with learning goals further supported by interactive exercises that use the target materials in context. Pronunciation along with the rhythm and intonation of natural speech are overlooked in the school curriculum. However, these are not merely “bonus skills” but are in fact the very building blocks of everyday speech. Set yourself up with your headphones and leave caution to the wind as you immerse yourself in the sounds, intonations and natural flow of the lesson audios. 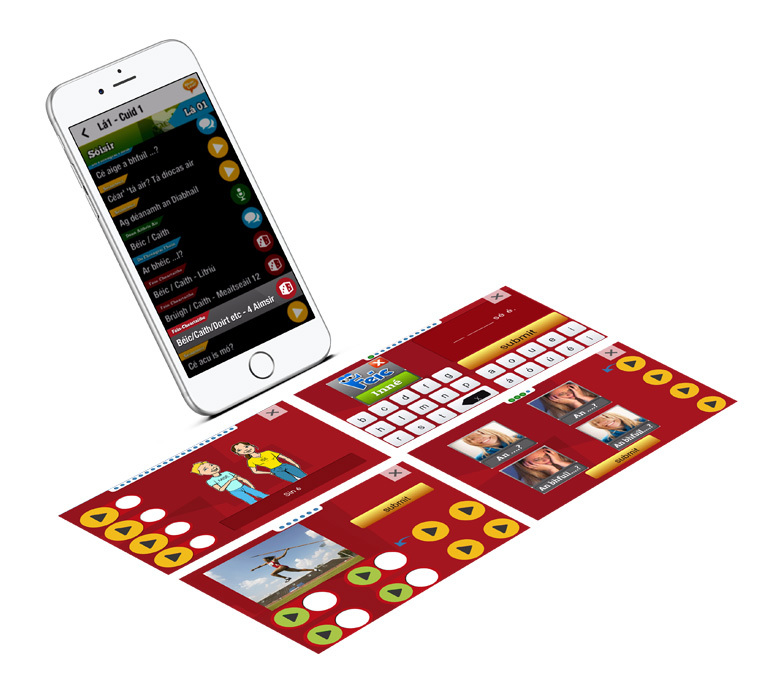 Play individual audios in “loop” mode and repeat them aloud and in character as they play. Being mistrusting and fearful of your own voice speaking Gaeilge is the biggest obstacle to progress. Confidence, is the most important attribute in language learning and is easily nurtured as it only requires practice. Above all else, adopt a proactive approach to building confidence and recognise that speaking, practising aloud, honing pronunciation and playing with the language is what makes all the difference. New material is presented in audio form using native speaker recordings. These may be replayed and repeated aloud as often as is required. Getting in “character” and mimicking the sounds of the target audios, guarantees the best returns. The goal is to imitate as you practice new words and phrases. Repetition is the key to locking the new vocabulary and pronunciations into your long-term memory. So, don’t rush through the exercises. Instead take your time to practice out loud until you are ready to make your own recording. Then, listen to your recording and compare it to the original. If you don’t feel your attempt is sufficiently clear, you can simply try again. The value of independent learning is that you can proceed at your own pace and you discover for yourself the correct form, pronunciation and intonation. Lessons have between 12-15 native speaker audios and the objective is to have an intensive “practice” session in listening, repeating, recording, listening back, noticing, rerecording and comparing. As with acquiring any new skill, repetition is key, so repeat as often as you possibly can. Don’t settle for mediocre pronunciation. Practice, practice and then … you guessed it: PRACTICE! Task-based learning activities’ are a powerful way to learn form/function relationships. These are usually audio-based, requiring recognising, identifying, spelling, associating and putting in context the key phrases, words and concepts of the lesson. These should not be a passive exercise, with learners quietly guessing correct answers. Instead, audio should be repeated aloud as you work with them. This greatly increases the engagement value of the work. On completion you receive immediate feedback, and you may redo the tasks as often as you like. Only your final score will be saved in your work portfolio. The score isn’t what’s important. It’s about the amount of quality time you spend playing with the audios and how well you connect with the content. This challenge/respond section is the most … well, challenging, as it requires you to use the language in a meaningful way. Instead of simple listen/repeat sequences, here you are asked to record your independent response to questions or prompts, requiring you to recall phrases quickly as you would in real-life conversations. These high quality interactive exercises use the principle of anticipation to mimic real life conversation as you are challenged to respond to prompts in real time, then move on to the next. This quick-fire, Q & A approach is an excellent way to develop quick reflexes as you begin to think as Gaeilge. Remember, as always, the key to developing a rapid linguistic reflex is practice, repetition, practice, repetition. And more practice! Attaining functional fluency in Gaeilge is all about practice, lots of practice. Partaking in social and informal dialogue is by far the most effective way of attaining functional fluency. Developing an awareness and confidence about using, living, enjoying and having fun with the language is our ulterior objective. Speaking Gailge freely in real everyday situations is what a Gaeltacht course is all about.